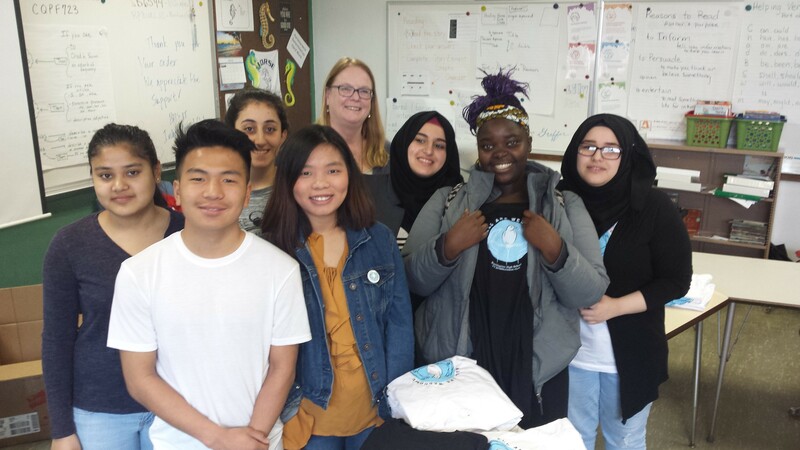 Four months after Burlington High School's International Club's peace project took off, the students are scaling up to bring their message to the masses. In December, the club created a symbol to help spread the message that Vermont is a welcoming community despite increasing anti-immigrant and anti-refugee sentiments around the country. 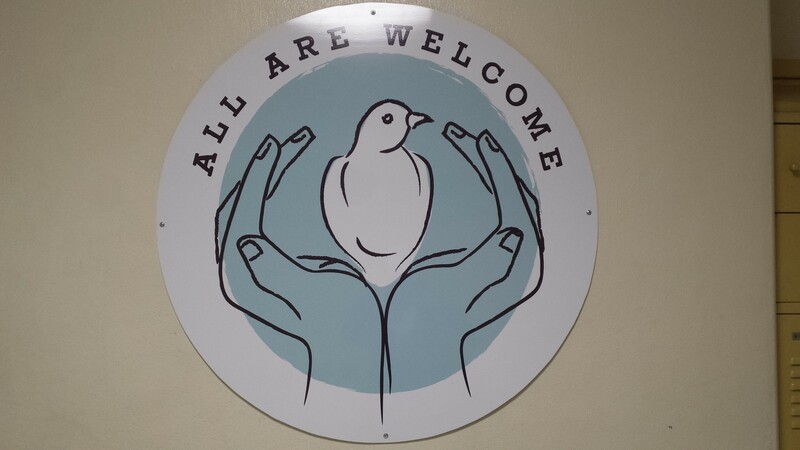 The result is a picture of a dove resting on a pair of cupped hands, framed by the phrase "All Are Welcome." The club's advisor, teacher Susan Blethen, later created a GoFundMe page to raise money to reproduce the symbol on pin buttons, posters, postcards, car magnets, bumper stickers and t-shirts. The merchandise is available for sale at the high school and on Etsy. All proceeds from the merchandise will go toward funding a New American scholarship, which was started by retired teacher Terry Beuhner, as well as to help new students with supplies. "We really hope this [project] will grow and grow and grow," said BHS senior Radhika Tamang. The IC members, majority of whom are from immigrant or refugee backgrounds, aren't only concerned about fellow Vermonters. The club will also be part of a fundraising dinner at the Integrated Arts Academy at H.O. Wheeler in the Old North End in mid-May to support drought relief efforts in Africa. Last month, Tamang, 18, attended the American Academy of Pediatrics Annual Leadership Forum in Chicago. The Nepali teen received a standing ovation after sharing the club's story, according to pediatrician Andrea Green from the University of Vermont's Children Hospital, who also attended the event. Together with Blethen, Green has supported the International Club since its inception. "I think it was very nice that everybody was so welcoming and accepting," Tamang said. IC members have met with the school board, and some will give a presentation during an equity class at the University of Vermont on Thursday. Out-of-state pediatricians have started using the symbol at their premises, Blethen and Green noted. These include pediatricians from Family Medicine at the University of Virginia, Children's Hospital of Philadelphia and the Bellevue Hospital Center in New York City. In Burlington, the posters can be found in several locations including Church Street businesses and in schools. Club members said they've been approached by members of the public who are curious about their buttons. Shahed Khudaier, 17, said it isn't unusual for her to give her own buttons to customers at Price Chopper, where the Iraqi teen works after school. Khudaier, who moved to Vermont two years ago, admitted that when the project was at its nascent stage, she was worried that "no one will support us." "[But] the opposite happened," Khudaier said.